Making this bread is a bit long and involved of a process. But it makes an excellent loaf. There's just enough sour in the bread to make the flavor interesting. 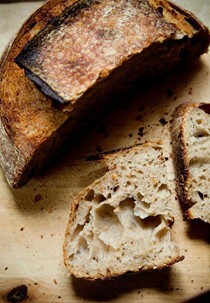 The crumb of the bread is loose and open without being too large. The crust was perfectly crunchy. The only negative was the bottom of the bread got a tad burned. This was great by itself and even better with some butter. I made ths bread and it was so wet I was sure it was going to be a failure. I decided to bake it anyway. When I put it in my dutch oven the dough did not hold its shape and spread over the base of the dutch oven. After the covered period of cooking I was suprised to find the dough had risen. After completing the cooking it looked pretty good although not the traditional boule shape. We cut into it a straight away and it was a bit sticky but after leaving it for a few hours it had dried a lot. The final loaf was moist and tasty. The baguettes have a nice flavor that's a bit more mellow than the basic country bread. The crust for the bread was good. The crumb was tighter than I expected (and didn't look like the picture in the book) but was still nice. First foray into rerolling a piece of meat and doing butcher's knots, bring on YouTube! Cooked for a meal rather than for cold meats. Had to really work to get crackling, because of the way it's cooked it can't happen normally. Enjoyable but not sure it created the impact I wanted it to with the cost and time it involved (although not hard work). Generally when there is still a huge slab of meat left by Tuesday night it's not one for rotation. Looked fab in the fridge though! Though I still have plenty more I want to make from this book, I can assure you it is full of gorgeous photos, reliable recipes, and invaluable baking expertise. One of my resolutions for 2012 is to keep trying with the very-wet category of bread dough. I’ve been open about my inability to bake ciabatta with a fabulous, holey structure. This recipe is delicious and very versatile. It’s salty and sweet, creamy and crunchy, and quick to whip up if you make the sauce while the vegetables are grilling. This is the follow-up to the successful Tartine, concentrating on the bakery's legendary bread, from one of the most celebrated breadmakers in the United States. A master formula for basic bread with many variations forms the backbone of the book, which also includes yeasted breads and recipes for sweet and savory foods made with days-old bread. 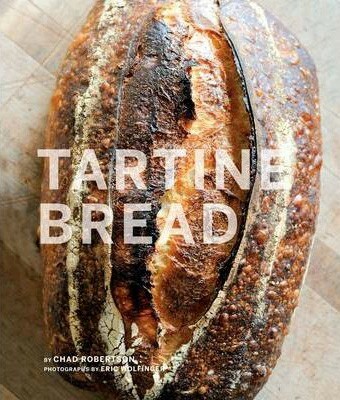 Chad's mastery of breadmaking and work with great artisanal bakers in the US and France, as well as his philosophy of baking, are features of this book.